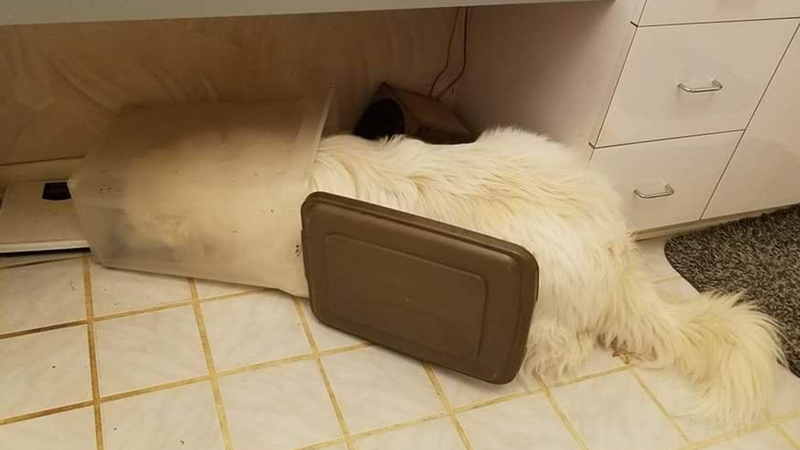 MIDDLESEX, North Carolina -- One dopey dog from Nash County is becoming Reddit famous for a photo showing him asleep in his food bin after eating everything inside. Jack is a 10-month-old Great Pyrenees puppy. Ryan Suydam, his owner, said there was about a day's worth of food in the bin that Jack indulged on before he promptly fell asleep. "He lives a good life as an indoor puppy with free access via a custom-made doggy door to the outdoors," Suydam said. A good life, indeed - Suydam told Storyful that Jack was 18 pounds when they took him home, and now, he's 101 pounds. Information from Storyful/Ryan Suydam was used in this report.